Here are the guys you need to hire for your next plumbing situation. Jack and Tyler promptly reacted to my emergency where I had no ability to flush any toilets. Hard working, knowledgable, friendly, prompt, and extremely price competitive are just a few words to describe what you will find with them. They are my new plumbing enablers. Thanks, guys, for a job well done. Just a note to say “thank you” for a job well done! 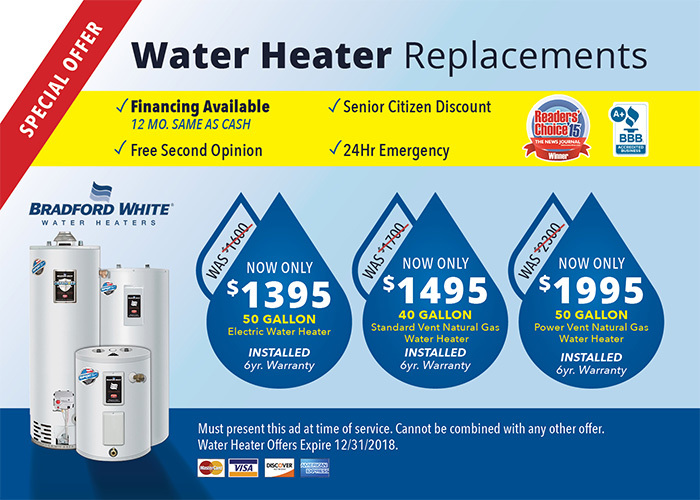 I called last Friday about a repairman visiting to give me an estimate on repairing or replacing our 11 year old Bradford White 50 gal hot water heater, which had a continuing drip from the ‘pressure relief valve’. We made an appointment for the following Monday morning between 8 and Noon. Monday shortly after 8 AM Tyler and Jon visited. We discussed the problem and possible alternatives and they offered solutions and discussed the cost of the alternatives. I opted to purchase a Bradford White 50 gal replacement tank with newer features, which they had on their truck. Within two hours the job was finished. Tyler and Jon paid careful attention to dismantling the old hot water heater and replacing it. They laid tarps on the areas they were going to walk with the equipment, drained the tank without incident, cleaned up when they were finished, showed me the ‘settings’ and how to change them etc. They also advise me that there was a full year guarantee on parts and labor if the new hot water heater needed work. Both Tyler and Jon were polite, professional and friendly. They made the job look easy, although I understand not all plumbers will replace hot water heaters due to the lifting requirements etc. Both of the employees I spoke to on the phone were also courteous, friendly, and polite. Again thanks for a job well done! I was very pleased with the installation of a General Electric Hybrid hot water heater completed by Delaware Plumbing Professionals. They showed up on time. Upon arrival, Jack, the owner, introduced himself, gave me his business card, and explained everything that they would be doing. They paid careful attention to cleanliness and left the area as if the were never there. Tyler and Jon were very careful when hauling the old and new water heater up/down from the basement and out the front door assuring that there was no damage to the new unit and our house. When the installation was completed Tyler and Jon made sure the new hot water unit was working properly and also made sure to show me where the shut off valves were and how to adjust the temperature and other controls of the unit. They answered all my questions. Jack, Tyler, and Jon were polite, professional, experienced, and knowledgeable with and team oriented philosophy. I had a very positive experience with Delaware Plumbing Professionals. Thank You and Great Job!!!!! I am sending you this email, to extend my sincere appreciation to Jack for the outstanding and efficient service he provided me with. Recently I was faced with an extremely urgent plumbing problem, which needed to be corrected immediately. I called several other companies in addition to Delaware Plumbing Professional, however the repair estimates I had received from other companies left me with little hope of a low cost repair. When Jack let me know all the important information, he came up with a cost that was more affordable for the repairs than other companies. I would like to take this opportunity to commend Jack and his crew for their professional, confident and prompt completion of the repair. After over twenty plus years of trickling water, I am pleased to say I now have a stronger water pressure. I am so pleased with Jack and his crew that I would highly recommend his company to anyone in need of a good plumber. Recently we had a leak in our home which became a mystery since our home was only a few years old. This mystery leak ended up being a problem on the roof and not the bathroom we had expected. Jack came out and diagnosed our problem with minimal damage to the ceilings. He wore booties throughout our house which we appreciated because we have white carpets. He did an excellent job and we truly trust his expertise and will recommend him to all our friends and family. Delaware needs more plumbers like this!!! !